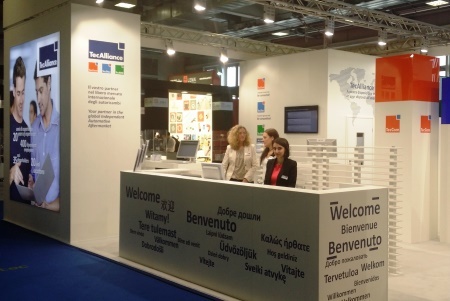 After the successful appearances at Automechanika last year in Frankfurt and the AutoZum at the beginning of this year in Salzburg, TecAlliance GmbH presented itself for the first time since the merger from 20 to 24 May 2015 at Autopromotec, the international professional trade fair for accessories and products of the automobile industry in Bologna, Italy. The great interest of the many stand visitors and the wide range of contacts made during the exhibition proved that this exhibition appearance was also a great success. Trade fair visitors could get an overview of the complete portfolio of solutions and products from the TecAlliance brands TecCom, TecDoc and TecRMI and learn about how the TecAlliance solutions add to the competitive strength of the international automotive aftermarket. At the professional conference “International Automotive Aftermarket Meeting 2015” (IAAM15) on 21 May 2015, TecAlliance Managing Director, Jürgen Buchert was among the speakers. The IAAM15 conference was held this year under the motto “Connected vehicle – connected business: opportunities and challenges for the aftermarket”. Speakers from renowned companies and business associations explained the latest technological developments in the automobile industry and the chances and challenges that the automotive aftermarket will face due to the new information and communication technologies. In his speech, Jürgen Buchert discussed the new competitors we can expect to find in the aftermarket and which aftermarket solutions will be successful in the area of connected cars. As to the question of how drivers view these developments, the first results were presented here. “The market solutions from TecAlliance already support aftermarket solutions in the connected car environment. Due to the highly dynamic nature of this new market, the entry of completely new competitors and due to the complexity of possible fields of activity, a market solution has a completely new meaning with respect to proprietary solutions”, emphasised Buchert. Stand visitors showed a particularly strong interest in the possibility of seeing individual presentations about the TecDoc CATALOG and the solutions from the product brand TecRMI. The offer of trial access to test the TecDoc WEB CATALOG was taken up by a large number of interested visitors. Autopromotec has established itself in recent years as an important platform for progressive technologies and new products in the independent automotive aftermarket and for workshop equipment. With 1,587 international exhibitors from 47 countries and 103,989 exhibition visitors the organisers again reported record numbers this year. Design and construction of the TecAlliance exhibition stand at Autopromotec were considered by stand visitors to be very successful.